A positive performance with the bat by the Sri Lankans wasn’t enough to deny England an 18-run win (courtesy of Duckworth-Lewis) after rain ended the match prematurely. Coming into the match with a 2-0 lead in the series, England won the toss and put the ball in Sri Lanka’s court by asking them to set England a target, which Sri Lanka did most impressively. Niroshan Dickwella (52 off 70) and Dinesh Chandimal (33 off 47) put on 70 for the second wicket to take the hosts to 89-2 in the 19th over, before Moeen Ali removed both batsmen (Dickwella leg before, Chandimal bowled). Dasun Shanaka (66 off 66, four fours, five sixes) and Dhananjaya de Silva (17 off 28) added 52 for the fourth wicket, Shanaka continuing his big hitting to add a further 58 for the sixth wicket with Thisara Perera (44 off 41). Perera and Akila Dananjaya (32 off 26) then smashed a quickfire 56 off 46 balls to shoot Sri Lanka’s score up to 273-7 at the end of their 50 overs. Moeen Ali (2-55) picked up the most wickets in the innings, while Adil Rashid (1-36, econ 3.60) and Chris Woakes (1-45, econ 4.50) proved the most economical with the ball. Jason Roy (45 off 49) and Alex Hales (12 of 23) put on 52 for the first wicket, followed by 24 for the second wicket between Roy and Joe Root. Root and England skipper Eoin Morgan then added 56 off 69 balls for the third wicket before rain brought an end to proceedings at the 27-over mark, giving England victory by 18 runs on the Duckworth-Lewis method. Root ended 32 not out off 57 balls and Morgan 31 off 34 balls, as England’s innings was brought to a halt on 132-3 (run rate 4.88). 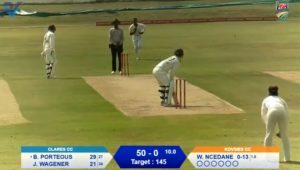 Lasith Malinga’s fearsome comeback continued, bowling five overs for just 15 runs (econ 3.00), while spin wizard Akila Dananjaya took both wickets to fall, ending with the impressive figures of 2-27 (econ 3.85). Morgan admitted he was flattered to pick up the Player of the Match award. ‘Today was a scrappy game. The wicket was a bit tacky, we let Sri Lanka creep up to a very competitive score. Credit to Sri Lanka, they fought back well, with their two spinners. They didn’t get too far away from us in the last 10. We were trying to be cagey with the rain all day. Our two best bowlers were Adil and Moeen so I bowled them out as quickly as I could. Woakesy has been incredible in the powerplay, we’re learning more about Olly Stone and Tom Curran has been outstanding,’ said Morgan. ‘We played some outstanding cricket. We can take the positives and are looking forward to the next game; 274 is a winning total and, unfortunately, the rain came. You can’t say every time when you are losing a game you made a mistake, we are a young unit and will learn quickly,’ said Sri Lankan skipper Dinesh Chandimal after the match. With the first ODI being rained out, England’s victory secures the series 3-0 with just one match to play in Colombo on Tuesday.